Hudson Technologies has leading capabilities and solutions for your custom deep drawn metal enclosures, case, header and metal diaphragms. Hudson Technologies' core capabilities are based on our expertise with a variety of high-performance metals, such as stainless steel and titanium, other metals include; aluminum, cold rolled steel, brass, copper, HY-MU 80 (other shielding alloys available), nickel, and cupro nickel. Offering customized solutions, our team can meet clients’ specific application needs and specifications — no matter how unusual or complex. Our technical support team works closely with customers from start to finish. 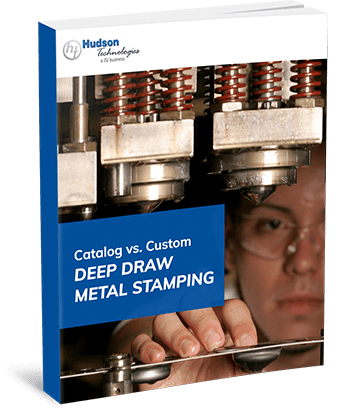 Our catalog has over 15,000 standard shapes & sizes with little to no tooling charges. Hudson Technologies is a leading U.S. manufacturer of deep drawn metal enclosures, or cases, and stampings, including metal diaphragms. Design engineers turn to Hudson Technologies for custom enclosures and metal diaphragms for all their equipment needs, whether they require a prototype or high-volume production. Our green manufacturing services include a full range of customization options, and our team is committed to close collaboration throughout every step of the process - from design to final production. In this way, we’re fully dedicated to forming partners through collaboration.